If I am honest, I love the meaning behind “liturgical” words. How cool is it to know that “advent” means “coming.” The “Advent Season” is the time prior to Christmas and we anticipate the coming of Jesus in time, in our lives and yet to be at his Second Advent (Coming). “Epiphany” means an unveiling, a flash of insight into something that is hidden. During the “Epiphany Season” our scripture lessons share with us how this man, the son of Mary, who looked like everyone else, was in reality God in the flesh. Indeed, learning the meaning of the words is something of an “epiphany” in and of itself. So, what does the word “Lent” mean? We all know that Lent is the season just before Holy Week. We know that it is a season of repentance and self-examination. We recognize our own mortality. So does the word “Lent” reflect this? I’m sorry to say, it does not. 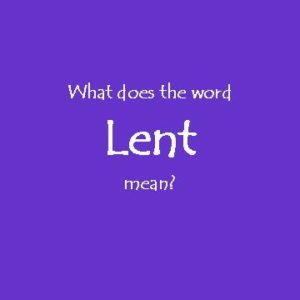 The word “Lent” means “longer” or “lengthen.” It comes from the Anglo-Saxon word lencthen. It reflects the natural fact that the days are getting longer as we enter into spring. Some, therefore, say the word means “spring,” which in a way it does. … Kind of a letdown if you ask me. But then, maybe, the word “Lent” can have some “Christian” meaning. The whole “turning the corner and now there is more light” is something like repentance. We are turned from darkness to light. The whole idea of the days getting longer gives a feeling of hope even though we are still in a time of the year when the nights are longer than the days. So we, while we live in this world of darkness, still know that the days of light are coming. We hope for the resurrection of the dead and the life everlasting, of which Easter is a foretaste. As the days get longer we can even think of the growth of the Church, as the Light of the Word reaches more and more people. I don’t know if the originators of the name for the pre-Easter season thought of the word “Lent” in these ways, but I kind of like it. Maybe you can think of a way to understand the word “Lent” in a way that applies to the season as it has developed. If so, you can leave your idea in a comment below.